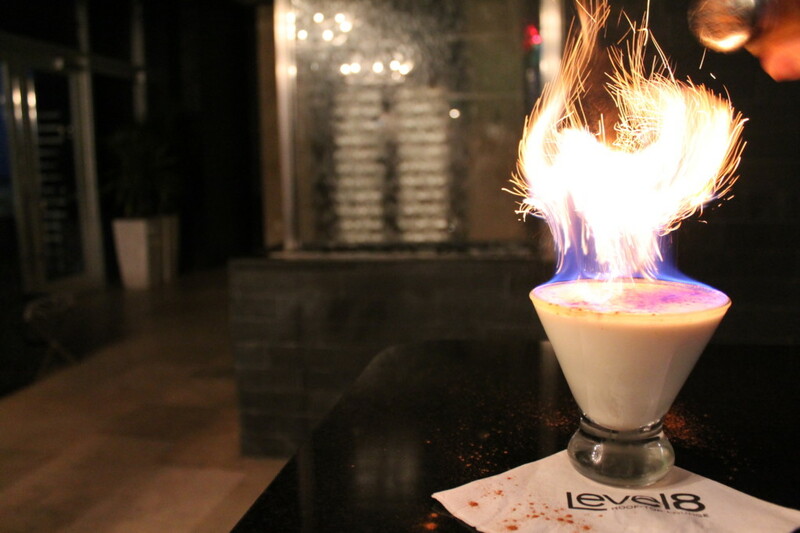 Forget everything you think you know about Level 8 Lounge. Hotel Duval’s renowned rooftop bar has spent 2014 completely reinventing itself and is now prepared to spend 2015 blowing Tallahassee’s mind. We did not simply add some items to our food and drink menus, we started completely from scratch. But not before hiring some of Tallahassee’s most esteemed creative minds in the hospitality industry. Our new executive chef, Bobby Cleek, has helped craft menus for some of Tallahassee’s most beloved restaurants such as Sage, Sidecar, Midtown Filling Station, and Jasmine Cafe. He had full creative range to reinvent our menu, and has perfected this eclectic combination of nuevo southern and Asian fusion cuisine. Not only is every dish uniquely delicious and fresh, but his flair for presentation is effortlessly beautiful. For the first time, Level 8 is not only a place to go just for drinks and ambiance, but now is also a culinary destination. After perfecting our food menu, we decided we couldn’t stop there. We knew our customers deserved more than that. They deserved to arrive at the best hotel in Tallahassee and go to a rooftop bar where the drinks are not only good, but on a completely different level. This is where mixologist Kevin Emmanuel entered the scene. He is a cocktail savant, part alcohol chemist, part spirit historian, and an asset to have as our Head Bartender and Assistant Manager. He concocted a flawless new cocktail menu of “Crafts and Classics.” Now when you come to Level 8, you can see the care and creative precision that goes into every drink, knowing that you are receiving an authentically delicious cocktail only privy to Level 8 patrons. Our staff at Level 8 welcomes any guests, either new or old, to come experience our fresh, new food and cocktail menus. These changes may just change your whole perception of our Lounge. We know you will love it because we have spent all year making sure! Come join our wonderful staff for a great time, because the view from the top is better than ever! Level 8 is in the Hotel Duval at 415 N Monroe St., Tallahassee 32301. Phone: 850-224-6000.